For more than 20 years, CP Medical has been a leading U.S. manufacturer of surgical solutions, specializing in products for wound closure as well as for oncology procedures and specialty surgical applications. Our deep-rooted experience and innovative solutions for surgical applications have enabled us to expand our product portfolio of suture and wound closure products for the medical market. 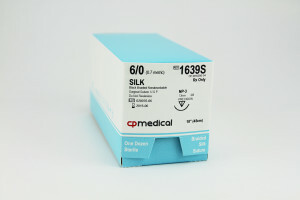 In addition to a comprehensive suture product line, we also provide specialty items for the oncology market, such as fiducial markers and brachytherapy needles. 5-0 Visorb Quick® P-1 18 in. 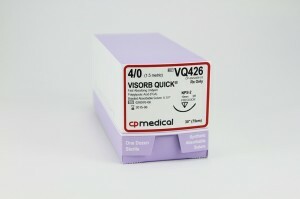 4-0 Visorb Quick® PS-2 30 in. 3-0 Visorb Quick® PS-1 30 in. 3-0 Visorb Quick® PS-1 18 in. 6-0 Plain Gut PC-1 10in. 5-0 Plain Gut PC-1 10in. 4-0 Plain Gut X-8 18in. 4-0 Plain Gut P-3 18in. 3-0 Plain Gut FS-1 18 in. 3-0 Plain Gut X-1 18 in. 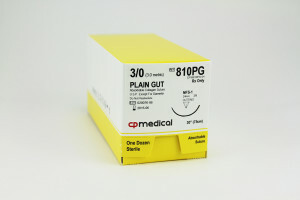 3-0 Plain Gut CP-2 18 in. 6-0 Silk P-3 18 in.